NO LONGER ACCEPTING REGISTRATIONS: To inquire about this invite-only, please email Bill Curran, Programming Producer, with a brief description of you and your company. NOTE: RVSP's are now closed for this invitation-only event. We will not be a taking any public registrations. Please inquire below for more information about the Summit. Providing a forum for leaders in podcasting, voice-driven interactive experiences, and other audio-based digital ecosystems to interact and explore the next wave of audio storytelling and technology. As podcasts and voice-activated experiences simultaneously become more popular than ever, the avenues for collaboration and innovation are ripe with new possibilities. Furthermore, digital agencies and media corporations are disrupting the existing brand engagement models, by using the intimacy and personality that audio-based skills/apps can provide to deepen customer loyalty (while also staying creative and cutting edge). 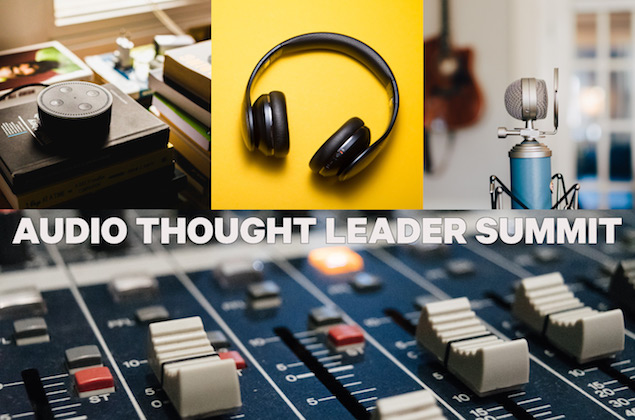 Our goal at the Audio Thought Leader Conference is to bring these seemingly disparate yet interconnected industries and strands of media together to think big and foster new connections. We’ll be “thinking big” through a series of keynote talks and special presentations/panels, and forging potential collaborations through networking and meeting opportunities. This day-long event is designed to launch discussions not only among industry trailblazers, but also aspiring creators in podcasting and audio-based storytelling with our Marketplace. Borrowing the successful model from Independent Filmmaker Project’s IFP Week, this long-form “speed dating” meeting session will pair our inaugural Podcast Certificate Program cohorts (and other hand-selected creators) with a variety of different media producers, platforms, brands, and outlets, giving these new talents a chance to pitch their skills and projects to industry vets. PLEASE NOTE: This summit is for senior/executive level leaders in the audio industry, as well as approved journalists. 9:30 AM Opening Remarks: Made in NY Media Center by IFP, Mayor’s Office of Media and Entertainment, NYC Economic Development Corp.
*INVITATION: To inquire about an invitation for you or a boss/colleague, please email Bill Curran, Programming Producer, with a brief description of you and your company. SPONSORSHIP: If your company is interested in learning about sponsorship opportunities, please contact Colin Whitlow, Associate Director of Business Development.